There are, on average, 12 billion web searches conducted in the United States EACH month. This ginormous figure highlights (and underscores) the importance of where your online content appears in search engine results and what can be done to improve a site’s ranking on search engines such as Google, Yahoo, etc. Search Engine Optimization (SEO) is the process of modifying online content to improve its “searchability”. 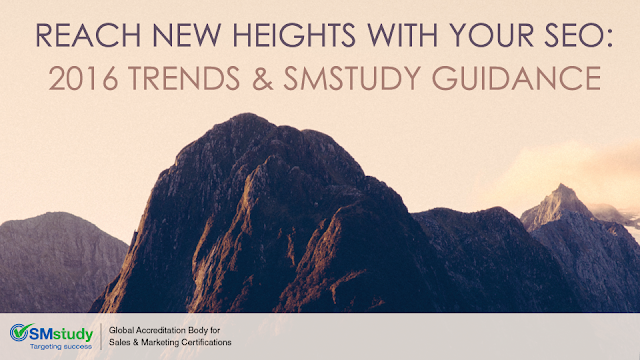 The SMstudy Guide®, Digital Marketing book describes SEO as an optimization of a website through editing, tagging or coding pages in order to improve online traffic. Since its rise to prominence in 2010, Search Engine Optimization has been evolving at a brisk clip and 2016 will be no exception. As we close out the first month of the new year, two important SEO trends are beginning to come into focus. In 2016, the lines will blur (even more) between social media content and traditional web content. As social media content is now being indexed by the search engines Google, Yahoo and Bing, the chances of social media content coming up in search engine results has greatly increased. This is good news for marketers, but it will require greater focus on incorporating SEO best practices into social media marketing. 1. Four out of five consumers use smartphones to shop. 2. 70% of mobile searches result in an online action (such as a purchase). With the continued increase of smartphone use, it’s no surprise that the latest Google algorithm update nudges mobile-friendly sites to the top of its search results. This is a clear indication that focusing on optimizing mobile content is now just as important as optimizing web content. SMstudy Guide, Digital Marketing, pgs. 77-78. “Eight Ways Social Media Affects SEO”, Brian Honigman, Sept. 11, 2013. http://blog.sumall.com/journal/8-ways-social-media-affects-seo.html#ixzz3yTSPgOWt. “From Brick-and-Mortar to Mobile Click-and-Order: Which Retailers are Carving Out Space in the M-Commerce Market?”, Sarah Radwanick Lead Corporate Marketing Manager, Sept. 19, 2012. http://www.comscore.com/Insights/Press-Releases/2012/9/Retailers-Carving-Out-Space-in-the-M-Commerce-Market. “70% of mobile searches result in an online action…within one hour”, Ahmed Ahmed, Dec. 20, 2012. http://www.socialmediatoday.com/content/70-mobile-searches-lead-action-within-1-hour-infographic. “Search Engine Optimization Stats,” Hubspot.com, http://www.hubspot.com/marketing-statistics.